I think I buy by the same rules as you do. Sometimes I even buy 0,5 meter fabric for shrugs and (tank)tops. But that also means I cheat sometimes by not paying attention to the grainline on the smaller pieces... Rensz on the other hand, says if you find fabric you like, just buy 4 meters of it. Great post! Sadly I have a beautiful red brocade from the remnants bin which only measures 60 cm x 1.37 m. I'd love to make it into a cape or jacket. But there probably isn't enough. Any suggestions? I'm a Burda size 36 or Vogue size 12, and a bit on the shorter side. So hopefully I can squeeze something out of this. Or am I being too ambitious? 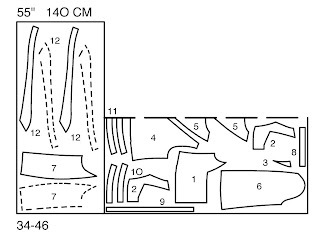 Most of my 1 yard fabrics goes into filling up y Darling Daughter's wardrobe, now that she is bit more grown up, i would require about 1.5 yards to make a frock with full circle skirt for here earlier i would do it in less a yard and still have fabric left? !